Over the last few years there have been persistent rumours about Monsanto supposedly getting into cannabusiness. This company, taken over in 2017 by Bayer, was suspected of secretly procuring cannabis seeds and patents for the future legalised market. Closer examination of the sources of this speculation rapidly revealed that so far Monsanto has no master plan for getting into cannabis production. In the US and Canada, the public have far fewer concerns about so-called genetic engineering than in Europe. Whereas in Europe anything to do with manipulating inherited traits rapidly encounters criticism, and not only in the hemp scene, this development in the cannabis sector was regarded as mainly positive overseas. It has already led to results in 2014 from a collaboration between a cannabis producer in Washington State and a former South African GMO company. The company Plandai Biotechnologies, which has now moved its headquarters from South Africa to Utah, is viewed as the favourite for growing medicinal cannabis in South Africa. Back in February 2014, it was announced that Plandai had signed a deal with the US cannabis producer Diego Pellicer for the distribution of cannabis extracts. Since 2015, this company has been growing cannabis in Uruguay for medicinal purposes and is involved in the state research programme there, in order, in its own words, to develop cannabis extracts. They plan to sell these in future as highly efficacious cannabis medication under the name Phytofare. Originally, US producer Diego Pellicer actually wanted to invest in Uruguay immediately following legalisation in 2013, but apparently the brand was too lifestyle-oriented to obtain a government licence for growing cannabis in Uruguay. As a result, in 2014 the former Microsoft manager and co-founder of Pellicer, Jamen Shively, searched for and found a partner in Plandai Biotechnology which could provide the scientific background and could provide a more reputable company profile. From 2014 bis 2016 , Shively was vice president of the company, whose main product previously was green tea extracts, whose bio-availability was to be improved using GMO techniques. For this, the company used their home-grown, GMO free tea, whose ingredients were to be made more easily available during processing using protein biosynthesis. Protein biosynthesis is what is generally understood under the term genetic engineering. This meant that until recently, Plandai Biotechnology has been the only company that could show any experience with GMO techniques and that is already conducting research on cannabis. In mid-September 2018, the Canadian cannabis producer Cronos and the biotechnology company Ginkgo Bioworks announced a partnership for the artificial production of cannabinoids. 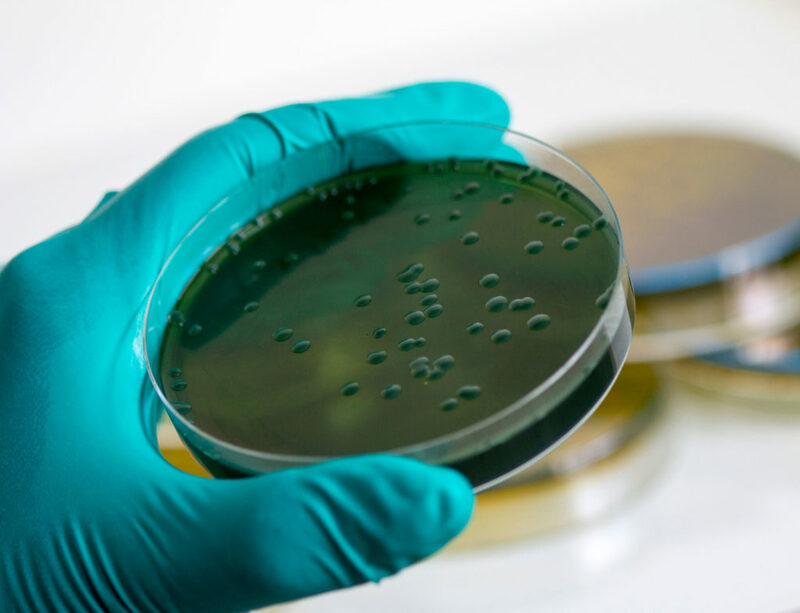 Using genetic engineering, this company, founded in 2009, has specialised in producing bacteria for industrial purposes. It wants to further develop this technology in the near future, with the help of 122 million US dollars of investment funding, into production of cannabinoids. Ginkgo Bioworks has its head office and a 9,000 m² laboratory in Boston, where the company currently produces scents for the fragrance industry. In a process similar to brewing beer, the DNA code is isolated that causes a rose to smell like a rose, and is transferred in a simplified form into the DNA for brewer’s yeast. “If you now use this product for brewing, rose oil will be produced instead of beer”, explains Jason Kelly, CEO of Ginkgo to Bloomberg. “It is cheaper, not dependent on weather conditions, the price is steady and it is no different to what you get by growing it in Morocco or somewhere else. It is simply a much better product. The application of this technology in the cannabis industry is obvious. For example, binding in tetrahydrocannabivarin or THCV, that works as an appetite suppressant, combatting the ‘munchies’ effect of cannabis. It exists only in minute quantities in the cannabis plant, which makes it difficult and expensive to produce it in the quantities needed to meet demand. Using Ginkgo’s technology, pure THCV can be produced in the laboratory”, comments Cronos CEO Mike Gorenstein about this step. The first step towards GM weed? The first step to genetically modified cannabis is therefore not, as so often forecast, coming from some evil global conglomerate, but rather from two small GMO start-ups in the US. In spite of multiple rumours there is so far no such thing as genetically modified cannabis. Since 2017, the new principal shareholder in Monsanto, namely Bayer AG, has shown interest in Ginkgo Bioworks and has already reached agreement on close collaboration in another field with the Boston start-up. The worldwide giant based in Leverkusen also holds a strong hand, with Monsanto being the leading GMO company in the world, if the smaller projects like Cronos and Ginkgo Bioworks plan to artificially produce various cannabinoids work out. A German company could also have made a deal like this. But when the Dortmund Technical University presented a similar procedure in 2010, no-one was interested at that time. Back then, researchers managed to obtain THC from coli bacteria. But even now in Germany, the subject may only be researched, while the development of cannabis medication is already a promising business model in other countries. The post Will we now see cannabinoids produced from genetically modified bacteria? appeared first on Sensi Seeds Blog.